Abstract This chapter analyzes conditions under which thought is formed by revisiting Plato’s chora and evaluating it in relation to philosophical notions of negation and black holes. Chora and black holes are immaterial objects that serve as openings for something to take place and each new development leads back to the unfathomable within the form. By circumscribing an object of perception, the border blurs the difference between inside and outside, and makes it possible to grasp how emptiness is needed for fullness to exert its full effect. Returning to the unthought, and preserving the non-separation of presence and absence, makes it possible to go beyond human limitations and to forge new networks of infinite becoming. Images of black holes signify what is before and outside all generation and if an absolute outside exists, whether we can think it or not, it may be possible to speculate on a continuum of existence and the possibility of universal subjectivity. Artistic practice, which is in a constant negotiation between the conceptual and the affective, is being challenged by engagement with nonhuman networks and movement away from the mediating role of human experience. Theoretically, any material or object that subsists on the same ontological plane as every other object can mysteriously transform into an aesthetic and philosophically significant experience. This experience, which operates on multiple levels of abstraction, indicates that what is grasped by cognition is not necessarily of its own making. Within this conceptual framework, the relation between the aesthetic and human creativity is retained but the role of art in human self-conception is in question: If aesthetics is the embodiment of uncertainty associated with pre-linguistic experience and art plays a role in human self-development, how do images configure thought when tied to systems in which they operate? The art in question, which arises at the intersection of thought and life, appeals to the nature of thought’s relation to the absolute and the possibility of universal subjectivity. This relation, when imparted through a material object, is not dependent upon the presence of a subject because its formal properties are exempt from that relation. Thus, to ascribe aesthetic properties to works of art engenders the paradox between discourse and its object because if there is no subject, the art only exists as a visible representation of a conception. What’s at stake is the nature of aesthetic discourse and how it contributes to describing a world where humanity is absent. In Plato’s theory of creation, chora is the link between being and becoming in which two different worlds converge, collide or explode based on a set of formal conditions rather than a perceptible entity (Timaeus 49-53). Having no identity of its own, chora is depicted as a material support, and at the same time, an absolute outside that is designed to receive whatever enters into it (Ibid. 50e). Structurally, it is inscribed as a figure for a middle ground, or as Derrida (1985) puts it, a milieu, that exercises its capacity not-to-be in order to receive what comes to be (p. 26). If this milieu is interpreted in terms of flux, in which everything becomes other than what it is, chora would be incapable of becoming ‘other’ because it is already ‘other,’ amounting to a ‘black hole’ of differences. This immaterial ground, which is written into the whole history of philosophy, is a disposition to receive everything that is offered and to be a receptacle for all that is inscribed (Timaeus 59d, 29b-d). Chora is a sign of negation that stands for uncertainty and not-knowing. Purportedly a vacancy that needs to be filled, it is constituted from within by a dark presence that precipitates an escape from the constraints of human existence. Never empty, it is a matrix from which something else originates, develops or takes form, and at the same time, serves as a material in which something is embedded or enclosed for protection or study. Cast as a positive assertion of the existence of relative difference or something ‘other than,’ chora is tied to complex issues of memory and expectation, but if where something comes to be is nothing, is it possible to make something of nothing if everything comes from something that already exists? If there is a possibility that something can occur prior to the existence of thought, what are the conditions for identifying this possibility? Chora, which is an arcane site associated with beginnings, not only accepts everything that enters into it, but having no identity of its own, does not place any limitations on what comes to be. If consciousness fails to do justice to the full depth of things and we can be taken by surprise by something that lies outside our relationship to these things, something new can arise apart from our knowledge of it. What’s in question is if chora, whose absence is present to consciousness in the way it emerges, unnoticed, in everyday practices, is it a divine feature of negation. Jacques Derrida (1985) points out that the word chora, whether interpreted as “place,” “location,” “site’” “region,” “country” or “mother,” “nurse,” receptacle,” or “imprint bearer,” is a matter of structure that belongs to the order and movement of meaning that is seen as a moment of loss and anticipates a future recuperation (p. 16). This space, which is the linchpin of Plato’s cosmology and the centerpiece of his story of creation, is part of the history of science that has been considered to be obsolete, but the Big Bang theory has contributed to a revival about the possibility of a divinely created universe (Timaeus 2000, p. xii). Black holes (Grant 2014), which are described by scientists as a region in space where light is not able to escape, are invisible, but what can be observed is the behavior of the material that surrounds or is very close to the holes. The smallest black holes are known as primordial holes which are thought to have formed soon after the Big Bang and there is scientific evidence to suggest that every large galaxy contains a large black hole at it’s center (Ibid.). This evidence is based on data that has been processed, quantified and measured, but what is operative in the data is not knowledge of the actuality of black holes, but the inability to establish the impossibility of their existence. Philosophical notions of the way we perceive negation involve a variety of perspectives that are often the result of operations having to do with what takes place around, inside and through holes. These operations, which yield certain visual patterns for perceiving a hole and for identifying what is seen, give rise to a series of relational ties between the negative entity and what surrounds it. Empty or full, holes account for distinctions between inside and outside, and things that are not there. Ontologically, if what we think is comprised of holes, and if holes do exist, what do they look like, and are they what we attempt to describe? Do black holes qualify as regions of space that allow for engaging in our surroundings, even if they do not exist? If the conception of nothingness is not the end of the world, is it the beginning of becoming another world? Black holes, likened to chora, could be emblems for the beginning of becoming, as Deleuze (1987) would say, or emblems for the thought of becoming (pp. 24-25, 293-98). Whether virtual or real, these receptacles are the ideal vector, to secure the necessary coupling to think outside thought in relation to a vision of the universe and its laws. Iconic symbols for unknown worlds in both art and science, what black holes stand for constitute a right of passage toward another sphere of knowledge that is accessed, indirectly. The non-seen of lost moments occupy this in-between space that makes impossible things, visible. Aesthetic objects carry out philosophical aims in visual language to show something about the dark uncertainty of unmediated thought that arises from the creative process itself. Received ideas, which acquire concrete specificity through aesthetic mediation, separate the object from where it came from and bind the object with an absentee being. This experience, which straddles the boundary between the banal and the profound, has the potential to say something about what is seen and not seen to say something else and to determine what it is. This potential, when attributed to the un-thought, is found in signs of negation that go beyond the verbal to contest how things exist in the world. If what cannot be put into words can be manifested in images and aesthetics is a semiotic agent of education, it is not impossible for the unthought to exist. Chora is a ‘changing room’ where subtle transformations arise and are enfolded into artifacts by way of formal methodologies. Differences are revealed in an on-going process that does not resemble what takes place in the building up of an image, but the routine of attending to and accounting for what is processed, allows for intimate lives and identities to be perceived and presented. Although chora cannot exist in physical terms, its immaterial nature that becomes real depicts an unseen world and mirrors the kind of activity that goes into the making of a work of art. The image, which rooted in evolutionary history, becomes a container for the uncontainable and a visual mimesis associated with incarnation that encourages complex readings of encounters with the divine. Any philosophical or scientific theory resting on the notion of negation/divination suggests that we perceive some discontinuity in the surfaces of material objects. In his famous puzzle illustrated by a black spot on a white background, Charles Sanders Peirce (1893) demonstrates that it is meaningless to attribute any color to the dividing line between black and white. The line could be either black or white, or neither black nor white, yet, something could be inside or outside the space defined by the surface (Casati & Varzi 1994, pp. 10-11). 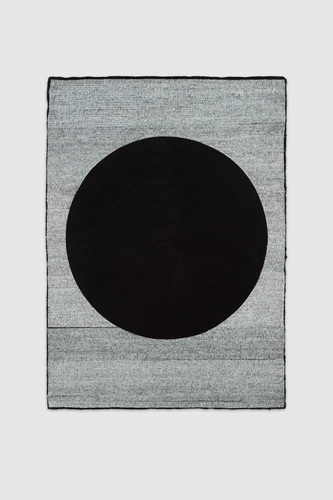 A black hole on a white ground is a disposition of visual space that is perceived as two differently colored surfaces. The boundary line between these two surfaces delineates the form as a material object and at the same time envelopes the form and is part of the object of which it is a boundary. Together, boundary and hole comprise a disturbance for thinking about what can be pictured. Physicist, Stephen Hawking and his group (2015), propose that information about matter is stored in the mysterious boundary that surrounds black holes (Grant, Sept. 3, 2015). This imaginary sphere is referred to as the “event horizon”, and anything that happens within this sphere is invisible. Whenever a disturbance takes place, a hologram that slides along the border secures information that drifts into the black hole, and when something leaks out, it carries the information out. According to Professor Hawking (August 2015), there is another universe inside every black hole and black holes are possible gateways to other universes (Hruska, August 27, 2015). Hawking argues that if it were possible to pass through the “event horizon”, it would to be ‘sent’ by an object called a ‘white hole,’ on the other side. Theoretically, white holes are not known to exist, but Hawking suggests that they might have been responsible for the birth of our own universe. This theory, which is regarded as a solution to the “information paradox”, answers to the contradiction between the notion that black holes disappear along with the information they contain, and the law of physics, which says that information about the universe, is never lost. What happens around the edges of black holes provides clues to the black hole’s presence and situates negation as the centerpiece of its surroundings. Negation, which is a form of aesthetic disappearance that has to do with missing time, demands finding information to stretch the limits between what is seen and what never existed. Its pivotal role is to make room for an artificial addition, which is the basis of art. Peirce (1869), who used the expression, “other than” to define negation as an assertion of relative difference, echoes Plato who insisted that negation is not contrary but ‘other’ (Sophist, 257b). For chora to exercise its capacity not-to-be and to its capacity to-be-other, it has to submit to being a contradictory entity of which nothing can be said. If this contradiction is interpreted in terms of flux, in which everything becomes other than what it is, chora would be perfectly eternal, incapable of becoming other than it is because it is already other. As an indeterminate, blank, lusterless placeholder that continues to exist in its non-existence, chora is akin to a concept of ‘zero’, the mathematical symbol denoting the absence of all magnitude or quantity. The slang word for zero is ‘kill’ or ‘cut’ and it is a positional notation for ‘severance’ – the moment of time when something must or does happen – which is the original definition of absolute. Standing apart from the usual, chora, which is the origin of all contradiction and absurdity, operates through a series of cuts to both put things in motion and to guard against excessive excitation. Like a primitive organic bubble, it sacrifices a part of itself to effect a definitive separation between organic interiority and inorganic exteriority. For Reza Negarestani (2008), the cut, which takes place within and by way of a “universal continuum,” interweaves the particular and the universal in a cosmic field that includes human beings, and is a way to think about the independent relation of the universe to itself and its propensity for self-organization (pp. 17-24). For Plato, the world is an intelligent organism guided by its own nature that displays mathematical order and proportion in both body and soul. Anything that cannot be accounted for has to be brought to order in the course of time. The first line of the Timaeus sets the scene for dealing with lost time in a conversation that took place the day before: “One, two, three – but where, my dear Timaeus is the fourth of my guests of yesterday who were to entertain me today” (Timaeus and Critias, p. 29). The missing fourth forces Socrates to call upon those present to fill in for his absence and to make up for what is lacking in his description of an ideal society. The ‘craftsman of the intellect’ is charged with linking time and space with the good life but it is the characterless receptacle that creates space, where all change takes place. Plato’s chora is a sign for negation situated between being and becoming in which unexpected disruptions precipitate new beginnings. Catherine Malabou (2012), who takes up the negative possibilities constituted by an absent self, argues that disruptions that arise accidently, offer “an ontology in which being is becoming”, “a mode of being that is becoming” (p. ix). In art and education, this would entail moving beyond differences and embracing practices in which to begin is to become, detached from everything, to experience what comes one after the other, in mechanical sequences, having no apparent connection to one another. Malabou associates the work of negation with the kind of disappearance that imposes a new form on an old form without mediation or accountability. She refers to as, the “metamorphosis by destruction”, which is a form of impossibility that pushes the subject towards an outside that doesn’t exist and which has the power to create a total deviation of being (Ibid. p. 10). What she attempts to bring to light is a negative possibility that “bears witness to a power or aptitude of the negative that is neither affirmed nor lacking, a power that forms” (Ibid. p. 75). Symbolically, the possibility of negation represented as a primitive gesture of exclusion, has an affective origin, whether or not it is perceived. This black hole, constituted from an absent self, gives way to other possible beginnings, including an unthinkable nothingness of which we know nothing. For Malabou, the real question is, “how to think the void of subjectivity” (Ibid. p. 24). The Black Hole paintings and drawings, which can be read literally or metaphorically, may be interpreted as images of primordial selfhood associated with the un-thought. Brought into existence through a process that makes it possible to access what is not already mediated by thought, blackened surfaces do not reflect anything nor do they mirror any original insight or self-consciousness. Technically, the hole is a matter of structure that belongs to the order and movement of meaning that is seen both as a moment of loss and an anticipation of the future. Black Holes exhibit a laborious, craftsman-like quality but they lack the purposefulness to give them a reason to be. Row after row of tiny, consecutive ‘stitches’ indicate a series of instances traveled by the hand and eye to become the very basis of the production of the appearance of the hole. Singular digits embossed on a two dimensional plane capture the passing of time in a train of thought that surpasses what is intended, and implies a certain automatism that is exercised in a trance-like state. Moving methodically from one ‘stitch’ to another without thinking, is a process of equivocating states of being and becoming, fueled by the desire to see what unfolds and what is left behind. This slow deliberate procedure for arriving at an image allows for the possibility of contemplating something other than what you think you are doing and that what is being done is so far ahead of what you think, that you can never catch up with it. From a pedagogical perspective, the question is whether thinking is what one thinks or doesn’t know one is thinking, or if it is something else. Non-reflexive blackness makes ‘seeing’ impossible, but whatever comes into being from within the textual chain allows for the possibility of liberating the black hole and giving back an image assigned to the place of emptiness (Gasche, 1986, p. 208). There is nothing profound about the text other than the primordial selfhood that exists in its non-existence through the text (Ibid. p. 288). Lacking the aestheticism of reflection, it is the act of production that decides what becomes visible and non-reflexivity, which has to do with things that are not consciously directed, is similar to what Hegel calls a “speculative germ” that is found in the self-destruction of reflection (Ibid. p. 70). This ‘germ’ is a class of becoming that develops in practices that call for re-thinking the relation of thought to being. Hegel, who assigns this relation to the opposition between being and nothingness calls for a third position to bring them together. This third position, which serves as the thesis for a new dialectical movement, would make it possible for human beings to progress to the point of seeing the world beyond them as part of themselves. For Hegel (1979), mediation is merely self-negation and the process of departing from the self is the fulfillment of the self and becoming part of the environing scene. When the inner limits of thinking about what is being done is reached, Hegel argues that philosophical reflection faces the necessity of passing over into another mode of thought that will accomplish what is to be done. With the recognition of opposites as relative terms within the limits of the absolute, philosophical reflection becomes reason and makes the leap into absolute or speculative reflection. Displacement, which is the difference between an initial position and a later position, disrupts personal history while extending and embedding a personal story into a body of work that doesn’t belong to the artist. Spatio-temporal histories that pass through a medium and survive, are the result of various operations that cut away from the individual and become something else. Split between the artwork and the authentic self, what is encountered is not so much the authentically revealed self but rather signs that insinuate this absent self as somewhere present in it. In mediated idioms, imperfections are a fundamental part of universal subjectivity and according to Hegel, paintings move us because we feel what is missing and assume that painting itself is able to exhibit an independent mental life. “Some allusion to an element of the mind endows [art] with affinity to thought and feeling” and the art “object is free concrete intellectual being which has the function of revealing itself as a spiritual existence for the inward world of the spirit (G.W.F. Hegel, The Romantic Arts, 1;3). The notion that paintings think, act, observe and want to make contact implies that the mechanical application of painting is imbued with consciousness and that subjectivity can be transferred from humans being to artifacts. Entering into a relation with a work of art can be active or passive and much of what is learned is almost without knowing it. If aesthetics is a semiotic agent of education and painting has a mental life of its own, it is not impossible for the unthinkable to exist. Theodore Adorno (1997) argues that art is grasped through a complex relation between the object and what it is not. For him, “its law of movement is its law of form” and “what appears is the product of an inner-technical evolution” that “acquires its specificity by separating itself from what it develop out of it” (p. 3). What speaks out in art negates subjective reason’s claim to totality and the more the subject invests in the work of art, the more successfully does the subject forget itself and become aware of the work’s objectivity (Ibid. pp. 264-266). According to Adorno, every artwork requires thought to be fully experienced and stands in need of a philosophy that refuses all restrictions. This philosophy, which is “nothing but thought,” participates in the realization of the work by submitting to objective criteria and surrendering to the art of form (Ibid. p. 266). This kind of objectivity, when mediated by the disparity that transpires from within the materiality of the work and the negation of subjectivity, allows itself to be directed by external factors whose source is internal. Utilizing our perceptual resources to speculate on who we are and where we are, the interior matter of what is seen is intuited in the act of looking. Since figuration is implicated in looking and spatial absence refers to the internal composition of things, there is no need to mimic our objectivity in a work of art. By minimizing the gesture and getting the hand out of the way to think what there can be when there is no thought, images reverberate with ‘color’ and connect us with a sense that the inner world is the same as the cosmic world. The correspondence between inner and outer, when taken in moderation, is supported by the semiotic justification that “all inner qualities possess their unique signs through which they recognizably manifest things in the world” (Jullien 2004 p. 62). When new attention is brought to what is conveyed in an image, it is possible to draw attention to “perceptible expressions” of an invisible reality…as well as to its various corresponding symbols” (Ibid. pp. 62-63). For Quentin Meillassoux (2012), it is not a question of something happening prior to thinking, but that an event “can actually have occurred prior to all thought”, and this “schism” undermines all received ideas (p. 122). Discontinuities associated with negation and the properties of holes parallel a process of individuation in which parts that are cut away generate a new surface in which two distinct entities are in contact with one another. The relation an individual bears to discontinuity is the same as the relation to another object in the sense of being affected by or recovering from an interaction with it. As the surface undergoes a modification through some sort of mediation, an invisible being takes on a life of its own. From a psychological perspective, a dark shape that goes deep implies that the integrity of the individual can be restored. Every hole is necessarily dependent on its host in order to grow and come to be and it cannot exist without the object in which it is embedded or as it is configured within a common part. Constituted by space, holes are closely tied to what they are in but this complimentary relation to material objects can be conceptually unchained if we accept holes as immaterial bodies that can be filled by other worlds. If holes, like Plato’s chora, can be described receptacles of non-being, they could be the basis for the “explanation of the ultimate grounds of individuation of spatio-temporal (concrete) individuals” (Casati & Varzi 1994 p. 33). Absence as presence is brought to light through a process of departing from the self and becoming something other. Using images to think something outside thought revolves around the notion that consciousness fails to do justice to the full depths of things and the possibility of what lies outside our relationship to these things can arise apart from our knowledge of them. While it might be meaningless to think anything outside thought, there may be a semantic content to visual language, even if we don’t know what it is. Inscriptions, such as words, possess shapes that seem to move autonomously and enter into descriptions of the world through concrete entities. These entities, which are conceptual links between holes and how they are represented in language, depict what we perceive to be empty or full. David Kaplan, explains that these words are not strings of ink marks, but the paper surrounding them. The holed parts make shapes and the letters are the sum of these holes (Casati & Varzi 1994, p. 184). Like Rubin’s famous illustration of a vase-profile reversible figure, two elements in the same context interact in such a way as to make one of them emerge and the other disappear (Ibid, p. 169). In the semiotic world, there is no ontological ground for phenomena, only a negotiation of complex relationships among changing phenomena. These relationships include and implicate the human in the field of art and science by way of representation but it may possible to go beyond human limitations by analyzing the conditions under which thought is formed. This would entail a co-relation between art and thought and forging new networks of infinite becoming. To be does not mean to exist and to become does not mean to come into existence, it has always been in process. Black holes suspended within the subtle shades and nuances of an embroidered galaxy of stitches are constituted through the fabric of time. Time, which is an absolute outside that exists whether we can think it or not, is incarnated in works of art. It cannot be observed directly, but we can experience it in a certain volume of space through sensory qualities like color and shape. These qualities, which represent modes of relation between individuals and their environment, are incompatible with living beings because their reality is one of signification. To revisit a work of art, is to speculate on whether it appears in the way it is described or if it is something that comes into being with consciousness of its spatio-temporal forms. When put on display for the purposes of interpretation, the art is defined from within cognitive limitations but if art is part of a “universal continuum,” and thought is not distinct from the material process, it is possible to take up a project that describes the impossible position of the absolute. Adorno, Theodor W. (1997). Aesthetic Theory, tr. Robert Hullot-Kentor, eds. Gretel Adorno and Rolf Tiedemann, University of Minnesota Press, Minneapolis. Casati, Roberto and Varzi, Achille C. (1994). Holes and Other Superficialities, The MIT Press, Cambridge, Massachusetts/London, England. Deleuze, Gilles and Guattari (1987). A Thousand Plateaus: Capitalism and Schizophrenia, University of Minnesota Press, Minnesota. Derrida, Jacques and Eisenman, Peter (1985). “Chora”, tr. Ian McCloud, Chora L Works, eds. Jeffrey Kipnis and Thomas Leeser, The Monacelli Press. Gasche, Rodolphe (1986). The Tain of the Mirror: Derrida and the Philosophy of Reflection, Harvard University Press, Cambridge, Massachusetts. Gale, Richard (1976). “Negation and Non-Being”, American Philosophical Quarterly Monograph Series, No. 10, Oxford: Basil Blackwell. Grant, Andrew (May 16, 2014). “The Mysterious Boundary”, (September 3, 2015) “Stephen Hawking Says His Group Has Solved a Black Hole Puzzle” in Science News Magazine of the Society for Science & the Public. Hegel, G.W.F. (1977). Phenomenology of Spirit, tr. A.V. Miller, Oxford University Press, Oxford/New York. Hegel, G.W.F., Lectures on Aesthetics, Part III, Of the Romantic Form of Art. Hruska, Joel (August 27, 2015). “Stephen Hawking May Have Finally Solved the Black Hole Information Problem” in Science News Magazine of the Society for Science & the Public. Jullien, Francois (2008). In Praise of Blandness: Proceeding from Chinese Thought and Aesthetics, tr. Paula M. Varsano, Zone Books, New York. Kaplan, David (1990). “Words”, Proceedings of the Aristotelian Society, Supplementary Volume 64, pp. 93-119). Malabou, Catherine (2013). Ontology of the Accident: An Essay on Destructive Plasticity, tr. Carolyn Shread, Polity Press, Cambridge, UK/Malden/Massachusetts. Meillassoux, Quentin (2012). After Finitude: An Essay on the Necessity of Contingency, Bloomsbury Academic, London/New York. Negarestani, Reza (2008). “Globe of Revolution: An Afterthought on Geophysical Realism”, Identities 17, 2008. Peirce, Charles Sanders (1893). “The Logic of Quantity” in the Collected Papers of Charles Sanders Peirce, Vol. IV, The Simplest Mathematics, ed. Charles Hartshorne and Paul Weiss, Harvard University Press, Cambridge, Massachusetts. Plato, The Dialogues of Plato, Sophist (1927). tr. Benjamin Jowett, Oxford University Press, Boni & Liveright. Plato, Timaeus and Critias (1977). tr. Desmond Lee, Penguin Group, London/New York. Plato, Timaeus (2000). tr. Donald J. Zeyl, Hackett Publishing Co, Indianapolis/Cambridge.